In recent research, it has been confirmed that gardenia fruit extract which promotes the generation of glutathione, which works on dopaquinone to promote the production of phaeomelanin, a type of melanin. There are two different types of melanin, eumelanin with black pigments and phaeomelanin with yellow pigments. In general, eumelanin plays a role in darkening the skin. Accordingly, the increase in phaeomelanin and decrease in eumelanin makes the skin appear whiter. Made fresh at the time of each purchase to guarantee freshness. Conditions water and provides nutrients to the skin. Leaves skin petal soft and lightly fragranced. Great muscle relaxer and an excellent stress reducer. Provides relief from psoriasis Epsom salts relieve muscles aches and pains. A sea salt bath provides relaxation and mineral to your skin. Our 8 Herbal extract blend helps to revitalize the skin. Made fresh at the time of each purchase to guarantee freshness. Conditions water and provides nutrients to the skin. Leaves skin petal soft and lightly fragranced. Great muscle relaxer and an excellent stress reducer. Provides relief from psoriasis. Sea salt relieves muscles aches and pains. A sea salt bath provides relaxation and mineral to your skin. Eucalyptus helps to revitalize the skin and to soothe the soul. 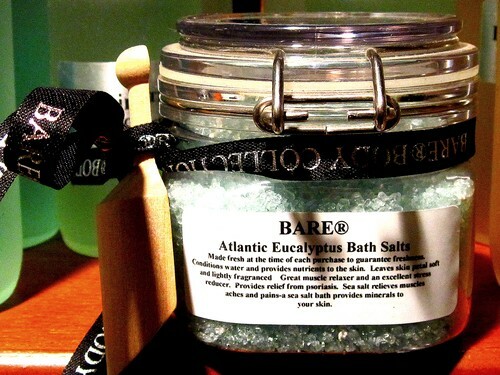 Epsom Salt, Atlantic Ocean Sea Salt, Dendritic Salt, Fragrance, Color.